The one where I say you simply can not screw this recipe up, and then tell you that you should probably watch a 5 minute video before trying this out. I love baking bread. Love, love, LOVE it! There is something so cathartic about the whole process, especially given our culture of rushing and hurrying and sort of blasting through life. You can’t do that with bread. It is a slow process, and requires a careful hand, a patient heart, and a bit of courage. Courage, you ask? Yes, at least for me. Because, although I love baking bread, I would not say I am very good at it. Bread is finicky. If you proof it too long or at too warm a temperature, it will sink and then you just spent 3 hours creating a brick. Not enough kneading… brick. You have to be careful not to kill the yeast or… brick. I have baked a lot of bricks in my day. But it doesn’t keep me from trying. For me, baking bread is more about the process than the end result; although, I won’t lie… I get sad when it doesn’t turn out. But I think that’s part of the experience; putting your heart into it and hoping it will all work out perfectly. It’s like a love story. 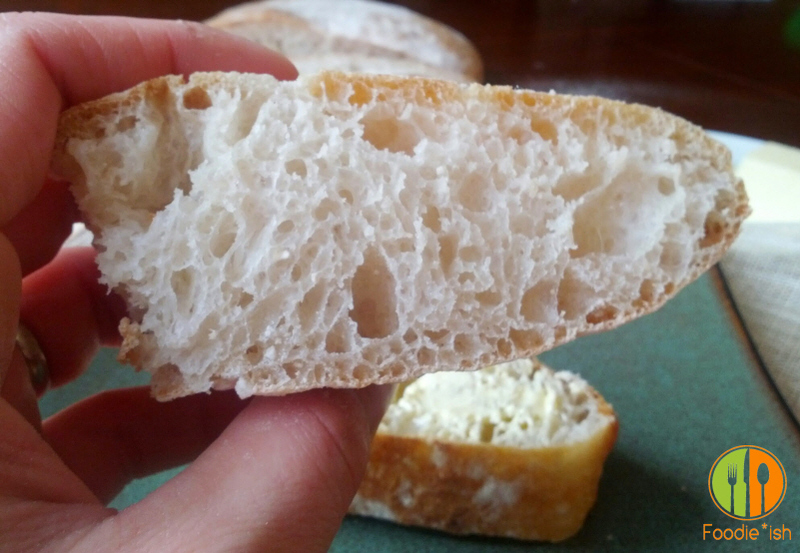 And I think that is why this ciabatta bread recipe is my true love. You seriously cannot fail. I have destroyed every type of bread I have ever attempted, at least once, save for this. From my first attempt to… man, I must have made this 100 times at this point… it has turned out perfectly. Every. Single. Time. So even though this is going to seem a bit difficult, and quite unlike most breads you have or ever will bake, I promise, if you try it, you will be hooked. 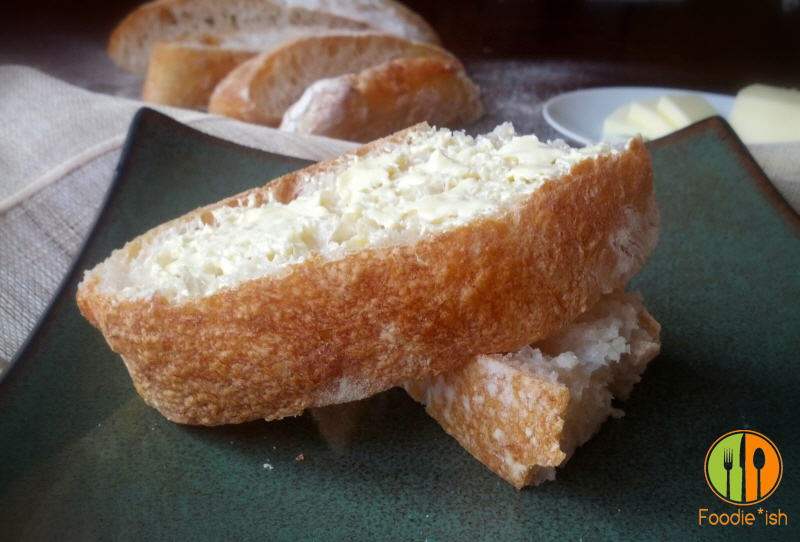 It is my go-to bread, and it is the star of my Chicken Bacon Ranch Ciabatta Bread sammies (which truly are addictive). 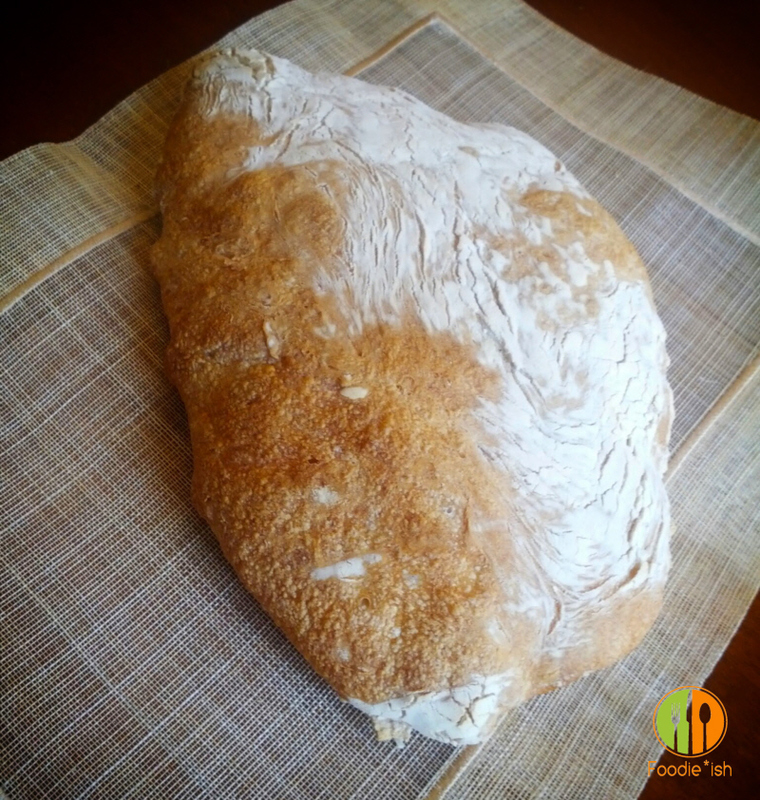 So roll up your sleeves and lets bake some ciabatta bread! I have modified this recipe a little from Jason Molina’s original that I found on a wonderful forum for amateur artisan bakers. If you are a seasoned bread baker or even a newbie just dipping your toes in, I highly suggest bookmarking The Fresh Loaf. I have spent hours on that site getting tips, and tricks, and of course gobbling up bread recipes. Additionally, I highly recommend watching this video that shows this recipe being prepared. Much of your success is going to be in knowing what consistency your dough should be, how to know when it has been fully kneaded, and what it looks like when it is fully proofed. I’ve included some images in the recipe, but the video is really helpful for your first attempt. Lastly, please read the directions thoroughly BEFORE you start to make this bread. There are a lot of tips and tricks that will save you some unneeded stress. 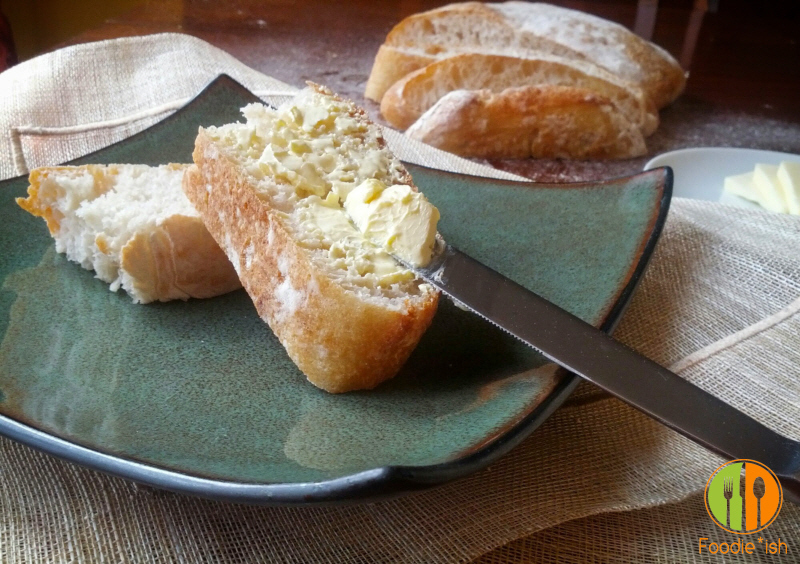 This bread is perfect all by itself, or warm with a little butter. 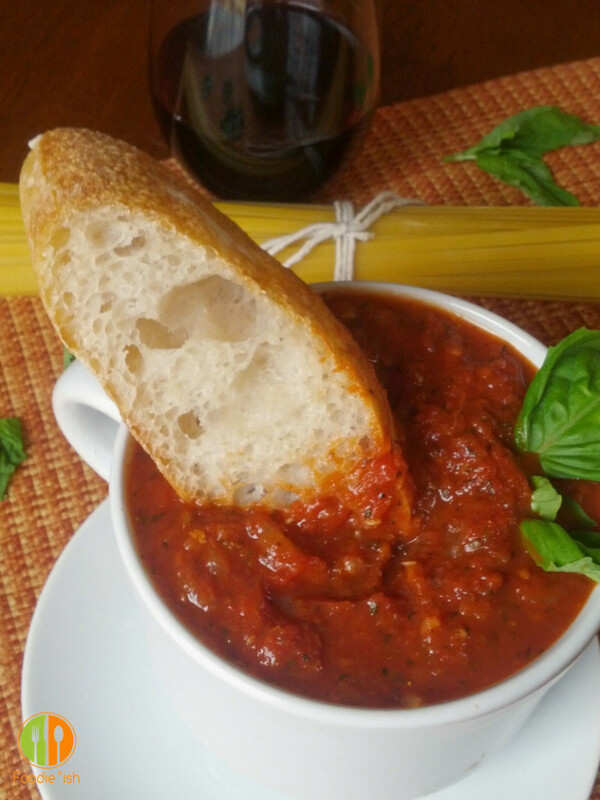 And I have been known to make a lunch out of it by pairing it with a bowl of The Only Marinara You Will Ever Need. SOOOO Yumtastic! *A standing mixer is an absolute must for this recipe. I don’t think it would be possible to create without one. And I have only baked this using a baking stone. The temperature is super hot, almost broiling, so If you don’t have a baking stone, use an inverted broiling pan. I can’t say for sure that this will have an impact on the final result, but it is an alternative to the stone. 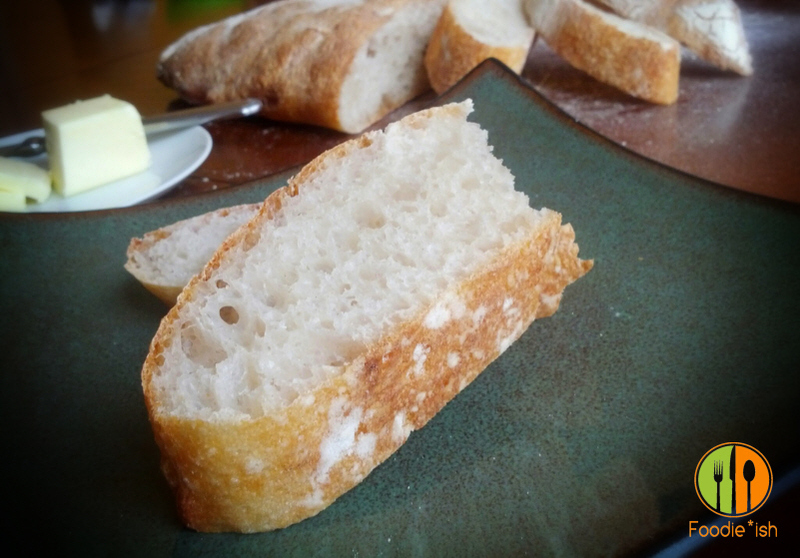 If you’re really Foodie*ish, and want a good stone for pizzas or this bread (and you will, because this ciabatta bread is addictive and you’ll want to make it all the time), I highly recommend the Old Stone Oven pizza stone. It is a little pricey, but I assure you, you get what you pay for. I will have this thing for a lifetime, and it really makes a HUGE difference in the final product of pizzas and artisan breads. Plus, it’s sort of Foodie*ish… like we’ve upped our game a little when we have cool tools that impact the quality of our food, right? If you purchase through the link shown, I will receive a small percentage of the sale price and it doesn’t affect the price you pay at all… it just helps support Foodie*ish. So thank you!! Add all ingredients in to the bowl of your standing mixer. Using the paddle attachment, mix until all ingredients have combined. It should look like a wet muffin batter. Turn of mixer and let it sit for 10 minutes. Once rested, crank your mixer up to 7 or 8 and beat the heck out of that batter with the paddle attachment. 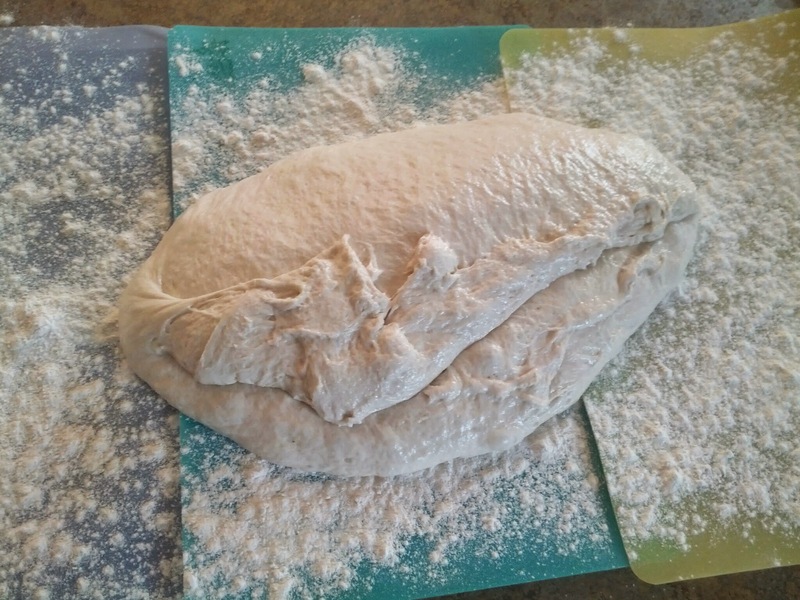 It will be hard or you to resist the urge to add flour, since it looks like muffin batter and nothing like dough, but after 10-20 minutes of beating the daylights out of it, it will begin to resemble a sticky, very smooth dough. Once the dough starts to creep up the sides of the paddle attachment and creeps near the top 1/3 of the paddle, switch to the dough hook and crank it up to 7 or 8 again and knead that thing into oblivion for another 5-10 minutes. You will know when the dough is ready to proof when the entire ball of dough pulls away the sides AND the bottom of the bowl as well. I know it is hard to believe that your muffin batter could possibly congeal itself into a substance that pulls away from the bowl, but I assure you it does. 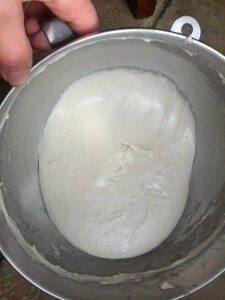 Once you turn off your mixer, the dough will ooze back into the bottom of the bowl. It will look like a thick, sticky, gelatinous dough. At this point, I simply cover the bowl with plastic wrap and let it rise for about 3 hours or until TRIPLED! You will likely have a dough line toward the top of your bowl that the dough made during the mixing process… I use that as a gauge for when my dough has reached a full proof. Once the dough reaches that line, I know it’s ready. 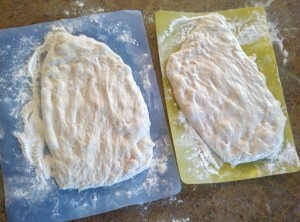 Once it is proofed, cover two cutting boards with flour. You want really nice coverage because this dough will stick to anything not covered. 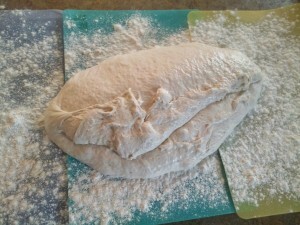 Dump your dough onto the floured surface (you may need to use a spatula to get it all out) and divide into two pieces. I use a pastry cutter dipped in water to keep it from sticking to the dough. 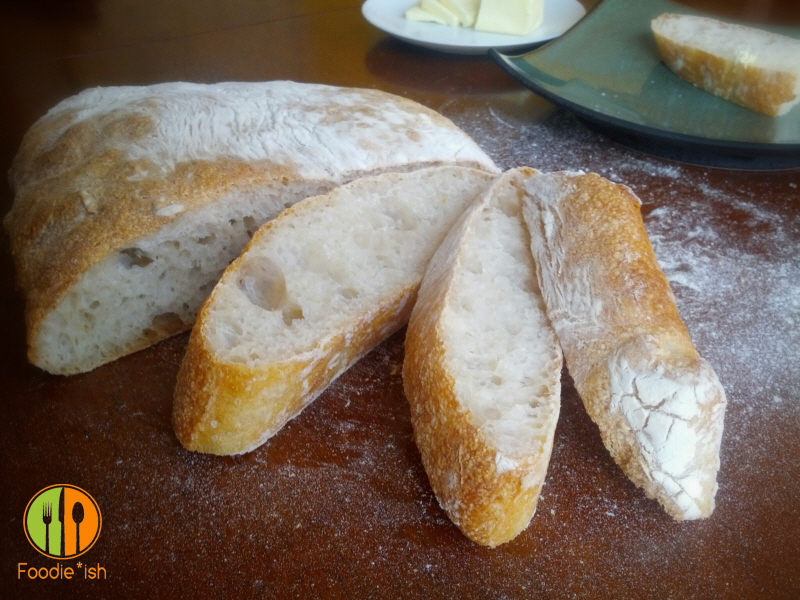 Once cut, gently tug and pull into a loaf shape (roughly 10-12″ long and 6-8″ wide and rectangular). it will be fairly flat and gooey. That is okay. No worries. Gently poke the top a bit to disburse some of the bubbles. Cover liberally with more flour. Anything not covered will stick to your garbage bag. Say what? 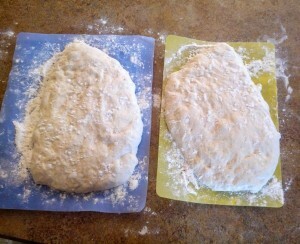 Yes, once your loaves are covered in flour, cover them with a CLEAN, NEW garbage bag and let rise for 45 minutes. Meanwhile, put a baking stone on the center rack and crank the oven to 500 degrees. Your dough will look only slightly more risen. That is good. This bread has an insane amount of oven spring (i.e. it will puff up in the oven). Put a baking stone on the center rack and crank the oven to 500 degrees. Take a piece of parchment paper a little larger than your loaf and place it on a pizza peel, an inverted cookie sheet, or a rigid cutting board… anything that will allow you to slide your loaf and parchment paper onto your insanely hot baking stone. Now take one of the cutting boards with one of the loaves and flip it over onto the parchment (so the side that was facing up during the rise, is now on the parchment). Trim parchment if necessary and slide onto your hot baking stone. Bake for 15 minutes, or until golden and the internal temperature is roughly 200 degrees. Repeat with second loaf. Let cool on a rack until ready to mangiare! These freeze really well. Just wrap tightly in plastic wrap before freezing. This recipe is adapted from the original by Glory Thorpe of Foodie*ish and was originally published on Foodieish.com. The original recipe can be found on The Fresh Loaf. All content and photos ©2015 Foodie*ish. All Rights Reserved. This bread looks so good!!! I’m going to have to try it. I just watched the video. The question I have is do you put a pan of water in the oven to create the steam like she did in the video? Hi Toni! Thanks for stopping by! Great question! I used to put the pan in the oven and let it heat like she does… and you do get a slightly crispier crust, but honestly I stopped doing it because one of the gizmos in my oven broke and I think it may have had something to do with the steam. Could have been coincidence, but I stopped using the steam and have had no complaints about how the bread turns out without it. You can always leave it in an extra minute or two if your crust isn’t quite as crispy as you like it. Hope that helps! !